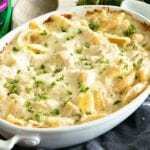 Creamy, Delicious Casserole with Layers of Garlic Alfredo Sauce, Pasta and Chicken! Save Yourself Time by Skipping the Stuffing of the Pasta! Perfect for a Weeknight Dinner! Cook pasta as directed on package, omitting salt. Drain water and set aside. Make sure to watch out for little fingers snitching pasta from bowl! Spray 2 quart casserole dish or 9x13 inch pan with non-stick spray. Spread 1/2 c. Alfredo Sauce on the bottom of pan. If you get any on your fingers make sure to lick off, of course washing your hands after this. In a large mixing bowl cream together cream cheese spread, basil, Parmesan, remaining Alfredo sauce and garlic powder. Stir in chicken, pasta, and 1 c. Mozzarella cheese. Mix until well combined. Layer pasta mixture over Alfredo sauce in pan. Top with remaining cheese and cover with aluminum foil. At this point feel free to lick any spoons you may have used! Heat oven to 375ºF. Bake casserole, covered, 40 to 45 min. or until heated through, uncovering after 30 min. Clean-up Tip: After you scrape out the last of the pasta, have the kids help fill the sink with warm water, and add a few drops of Palmolive® Ultra Strength™ and let soak to help remove the baked on residue. *This can be made ahead of time and refrigerated for up to 24 hours. Add an additional 15 minutes to the bake time. You can also freeze this for up to a month. If you freeze it thaw and bake when desired.